In the US, political intrigue, which appears to have been lifted straight out of a John Le Carré novel, has reached a crescendo. The players in this increasingly layered saga include not one but two former FBI Directors – James Comey and Michael Mueller, recently appointed Special Council responsible for investigating ties between President Trump’s campaign and Russian officials, Deputy Attorney General Rod Rosenstein, former National Security Adviser General Michael Flynn, the US Justice Department, numerous Congressional committees, senior Russian officials including President Vladimir Putin and at the heart of it all US President Donald Trump. There are now multiple investigations running concurrently on whether Russia interfered in the US presidential elections, whether Trump and his entourage colluded with Russian officials in the run-up to the 8th November elections, whether Trump knew that Flynn was already under investigation when he appointed him, whether Trump pressured Comey into shutting down a federal investigation into Flynn, whether Trump broke any laws in firing Comey for (amongst other reasons) investigating possible collusion with Russia and whether Trump acted against the national interest by allegedly divulging classified military intelligence to Russian counterparts. Presumably, in due course, there will be an investigation in how these investigations were conducted. The question growing louder, including within Congress, is whether there are any grounds for Trump to be impeached and if so how and when the process may unravel. But a straightforward answer has arguably not been forthcoming. For starters, the barrier to impeachment is high and material and irrefutable evidence – for example of abuse of power or obstruction of justice – is a sine qua non pre-condition. Moreover, there are few precedent to rely on – US President Richard Nixon resigned before he could be impeached and Bill Clinton was impeached by the the House of Representatives but acquitted by the Senate. If we assume that these investigations will take weeks or even months to run their course, the more pressing question is whether and to what extent this political backdrop is likely to impact financial markets, US government policy-making, the US and global economy and Federal Reserve (Fed) monetary policy. Equity markets are clearly voting with their feet but their reaction has so far been considered rather than panicked. The CBOE’s S&P 500 Volatility Index (VIX), probably the most commonly referred to measure of volatility, spiked from 10 to 15 on 17th May (see Figure 1). However, by historical standards this is still a very subdued level of volatility and only marginally higher than the 13.4 average recorded in the past year. 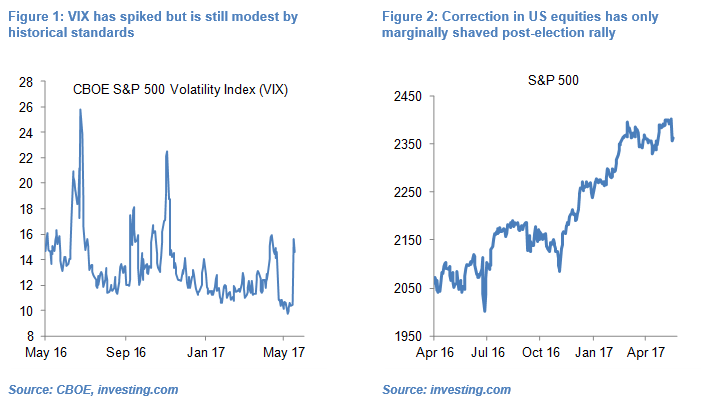 The 1.8% correction in the S&P 500 on 17th May was notable but again in a relative context this was a measured sell-off with the S&P 500 still up about 10.4% since the US presidential elections on 8th November (see Figure 2). In effect a market which had seemingly all but priced out expectations of equity volatility is now at least acknowledging that the post Trump honeymoon has come to an end and in rather dramatic circumstances. In this context positive US macro data surprises are struggling to move the needle on US equities. Despite industrial production data out on 16th May showing faster-than-expected growth of 1.0% month-on-month in April the S&P 500 closed down 0.1% (although admittedly industrial output data tend to play second fiddle given the relatively small US industrial sector relative to services). The Philadelphia Fed Manufacturing Business Outlook Index jumped to 38.8 in May from 22 in April according to data out on 18th May but the S&P 500 closed up only 0.4%. 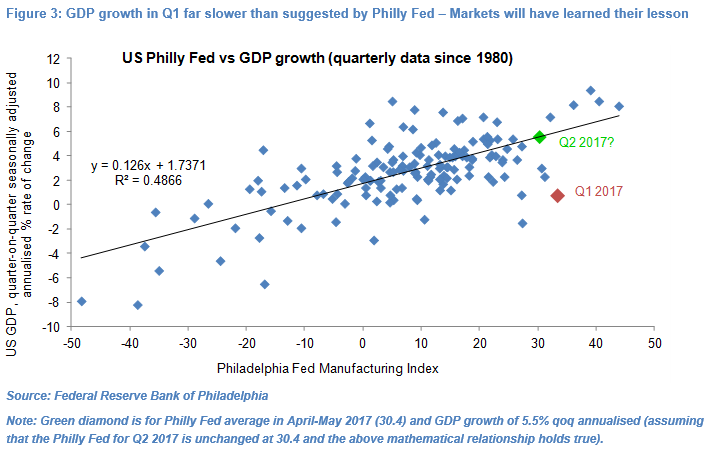 The market’s lack of reaction to another strong Philly Fed number could also be due to the fact that while a Philly Fed average of 33.5 in Q1 2017 had pointed to extremely strong GDP growth in the quarter the latter actually slowed to a 3-year low of 0.7% quarter-on-quarter annualised (the red diamond in Figure 3). Put differently, the predictive power of this advance survey has been cast in doubt and markets will likely privilege hard data. With the US equity market seemingly giving short change to all but the strongest hard data and the US corporate earnings season all but over, it is difficult to see how at this (political) juncture equities can launch another meaningful rally. If anything, the risk is asymmetric in my view with any big data misses likely to put further pressure on US equities. Trump’s presidency has until now been characterized by unfulfilled campaign policy-promises and the current turmoil engulfing the US administration and arguably Congress further increases the probability that Trump and/or Congress will be unable or unwilling to table any new major policy initiatives. Whether this is a good or bad thing from the perspective of the US economy’s long-term prospects is admittedly open to debate. However, to the extent that the rally in US equities has at least partly been predicating on the promise of “America First” policy initiatives, any further delays to promised tax cuts and infrastructure spending are likely to weigh further on US equities in my view. The already ambitious (unrealistic?) timetable for a market-friendly tax overhaul to be presented to Congress before the August recess – as suggested by Treasury Secretary Mnuchin back in February – is now likely to slip further, particularly as Congress has so far shown little appetite for a draft plan that is not fully funded. Moreover, Trump’s much vaunted infrastructure spending package is likely to be further kicked down the road. The bottom line is that fiscal stimulus is unlikely to drive US GDP growth near-term. 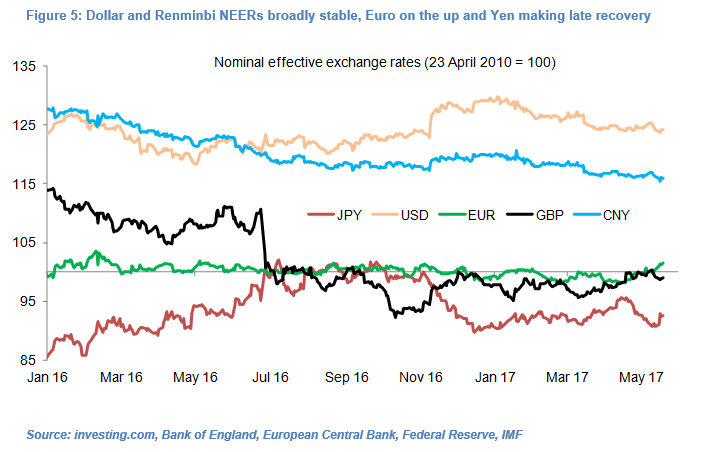 The US Dollar has in recent weeks lost ground to major European currencies, in particular the Euro (see red highlights in Figure 4) and more recently to the Japanese Yen. 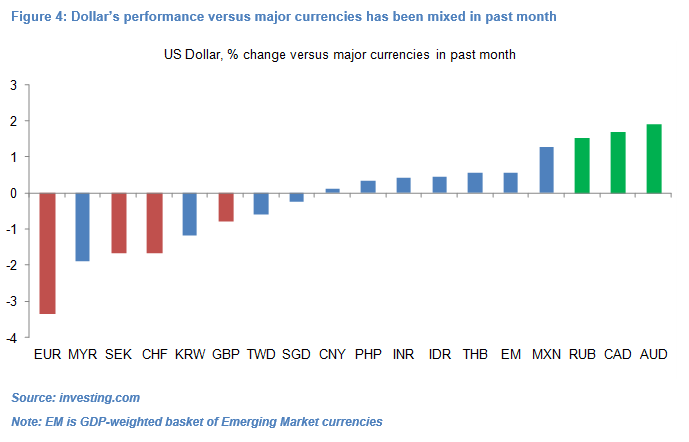 However, emerging market currencies (and in particular the Brazilian Real) and commodity currencies have performed even worse, with the Canadian Dollar, Australian Dollar and Russian Rouble depreciating in the face of falling commodity prices (see green highlights in Figure 4). As result, the Dollar Nominal Effective Exchange Rate (NEER) has been broadly unchanged in the past month according to my estimates (see Figure 5). The Euro NEER has appreciated to an eight-month high, according to my estimates, driven by a confluence of economic and political factors. 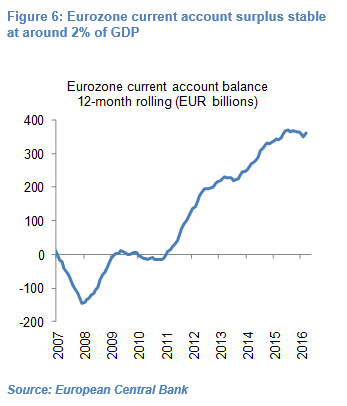 The eurozone continues to run a current account surplus of around EUR 360bn or about 2.1% of GDP, with the surplus reaching an all-time high of EUR 37.9bn in February (the latest data point available – see Figure 6). The Euro NEER has been remarkably stable in the past seven or so years and thus not suffered a loss of competitiveness, unlike the Dollar, Sterling and Chinese Renminbi which appreciated strongly in respectively 2014-2016 (30%), mid-2013-2015 (13%) and 2012-2015 (19%). Macron, the leader of the La République en Marche party has assembled a ”rainbow” government of centrists, Socialists, Republicans and civilians and replicated this pattern at a party-level. While La République en Marche may struggle to win a majority in the 577-seat National Assembly elections on 11th and 18th June, it looks on course to form a broader ruling coalition with the centrist Democratic Movement and perhaps one other like-minded party. Macron’s success in luring politicians from across the political spectrum – “divide and conquer” – has re-written the political rulebook. This approach contrasts strongly with the UK where the two main political parties – the ruling Conservatives and opposition Labour Party – are fighting a bitter campaign ahead of general elections on 8th June (see 2017 French elections – They think it’s all over…it isn’t, 11 May 2017). This is broadly in line with my bullish EUR/USD view expressed in December that “If, as I expect, the eurozone economy starts to benefits from the euro’s depreciation and US yields stabilise or fall, this yield spread may no longer be sufficient to push the EUR/USD cross lower […]. Finally, the risk of European nationalist parties acceding to the highest echelons of power has been over-stated, in my view […]. It may be premature to go long EUR/USD but this may well be the trade to consider, particularly in the run-up to the French presidential elections in April-May 2017.” (see Hawkish pendulum may have swung too far, 21 December 2016). It also tallies with my bearish GBP/EUR call that “I am sticking to my core scenario that […] Emmanuel Macron will fill one of the top two spots to make it to the 7th May run-off, which in my view would be welcomed by French financial markets and the euro even if markets remain jittery over the next fortnight. At the same time, the ever-changing political scene in the UK can do little near-term to avert the headwinds to GDP growth stemming from falling real wages and retail sales. With this in mind, I see the risk to GBP/EUR biased to the downside in coming weeks.” (see French politics, UK macro data and possible GBP/EUR downside, 21 April 2017). The Euro rally will conceivably extend a little further, in my opinion. After all the Euro NEER is only 1.3% stronger than the average level recorded since early 2016. The European Central Bank (ECB) appears comfortable with the common currency’s modest appreciation, which is perhaps unsurprising given that hawkish ECB Council members – led by the German Bundesbank – would like to see a tightening, even if modest, of eurozone monetary policy. With the French elections out of the way, the ECB may well subtly change its forward guidance at its 8th June policy meeting, announce its tapering intentions after the German elections in September and then deliver on bond-buying reductions. However, I would expect the Euro to eventually run into headwinds. For starters it is still unclear whether President Macron, Prime Minister Édouard Philippe and cabinet members are more valuable than the sum of their parts and whether La République en Marche’s “political salad” can deliver much needed structural reforms, deal with immigration and terrorism and reinvigorate the European Union. Moreover, the pace of ECB monetary policy tightening is likely to be gradual (read glacial), with the ECB Council still divided as to whether the pick-up in eurozone GDP growth and inflation is sustainable. US indicators of economic activity data, both official numbers and surveys, have been a mixed bag so far in Q2. 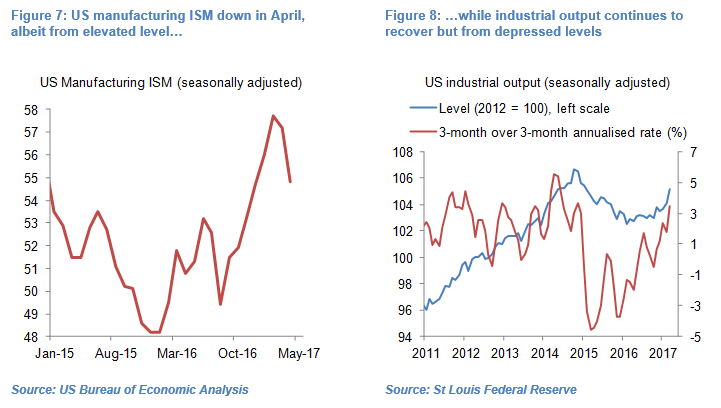 While the Philly Fed index in May surprised on the upside (see above), the ISM manufacturing index slowed sharply from 57.2 in March to 54.8 in April (see Figure 7). Industrial output growth momentum hit a 27-month high of 3.5% qoq annualised albeit from a low base (see Figure 8). 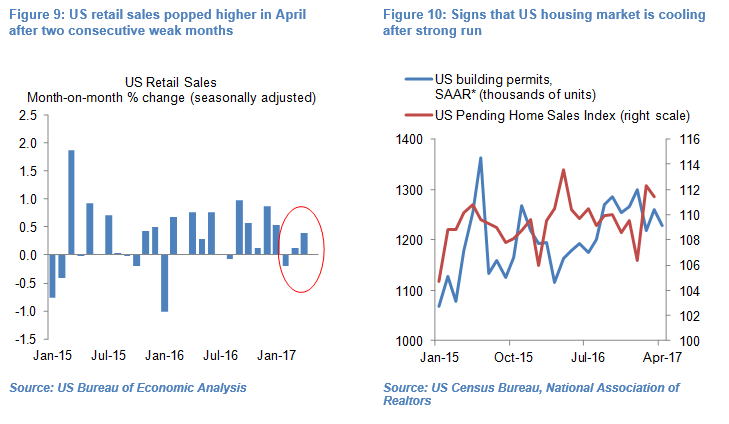 Retail sales growth picked up in April to 0.4% mom but had averaged zero in February-March (see Figure 9) and the US housing market appears to be cooling somewhat (see Figure 10). Global economic growth seems to have stabilised in Q2, albeit at levels a long way from recessionary territory and levels still likely compatible with a very slow and gradual tightening of global interest rate policy, including in the US in my view. However, many international institutions, including central banks, have seemingly based their core scenarios on global growth rising further. If these bullish prognoses prove a little premature, it is at least conceivable that a re-calibration of the language (if not policy) will ensue. 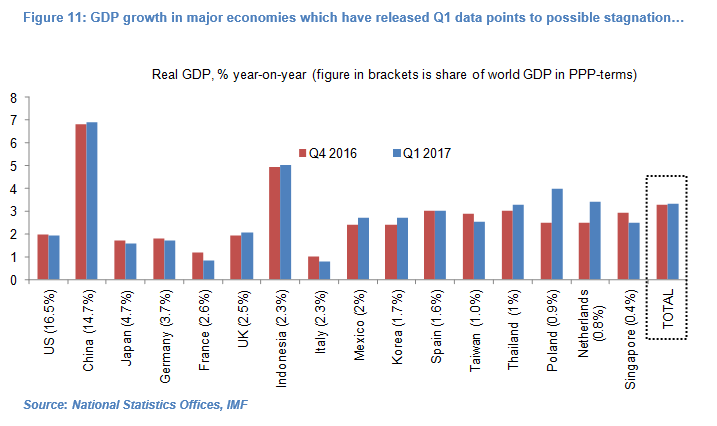 Major economies which have so far released Q1 data account for 60% of world GDP (on a purchasing power parity basis), according to my estimates. A weighted average of GDP growth in these 16 economies inched up only incrementally from 3.30% yoy in Q4 2016 to 3.34% yoy in Q1 2017 (see Figure 11). The global manufacturing PMI has historically correlated closely with global GDP growth and the pick-up in the PMI in Q1 to a multi-year high of 52.9 suggests that GDP growth accelerated further in Q1 2017 from just over 3.0% yoy in Q4 2016 (see Figure 12). This would also support the IMF’s conclusion in its latest April 2017 update that “global economic activity is picking up” and the ECB’s assessment at its policy meeting on 27th April that “Incoming data, notably survey results, bolster our confidence that the ongoing economic expansion [in the eurozone] will continue to firm and broaden. 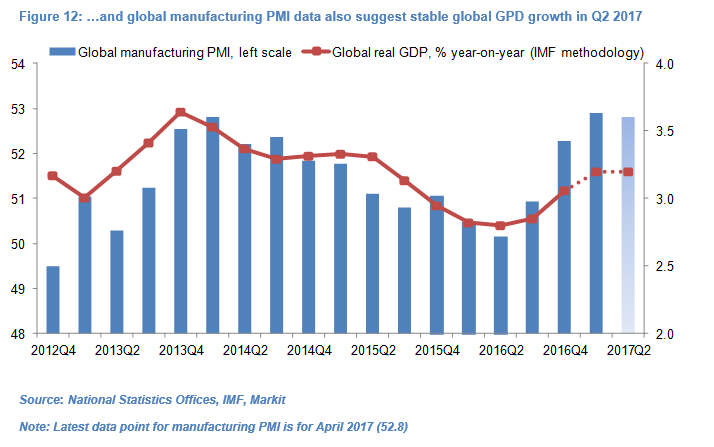 However, the global PMI was broadly unchanged in April 2017 which would tend to corroborate with country-data showing global GDP growth losing momentum. The Fed and US rates market have the unenviable task of making sense of these macro trends and a quickly changing political landscape. The apolitical Fed will of course stay above the political fray, even if markets do not with pricing for the probability of a 25bp hike at the 14th June policy meeting continuing to oscillate between roughly 60% and 75%. My core scenario is that the Fed will hike rates only once more in 2017 (following from the 25bp hike in March) although I acknowledge that this is not a high conviction call. The market seems still on the fence, pricing in a further 32bp of hikes in the remainder of the year. The Fed in its statement following the 3rd May policy meeting, at which it left rates on hold as expected, painted a broadly positive picture. It highlighted the strength of the US labour market and inflation running near its long-run objective of 2% and argued that the sharp slowdown in US GDP growth in Q1 was likely transitory. The message was pretty clear that the Fed wants to hike rates further, with the burden of proof that a June hike is unwarranted resting firmly with the more dovish FOMC members. However, that was 12 days ago and the Fed cannot conceivably ignore the likelihood that the government’s fiscally-stimulative tax-cut and infrastructure-spending plans have been further kicked down the road. The Fed will also have to contend on 8th June with both UK general elections and the ECB’s policy meeting. From a macro perspective, measures of headline and core CPI-inflation for April – released on 12th May – showed a further slowdown with core CPI-inflation falling to a 17-month low of 1.9% yoy (see Figure 13). The Fed and markets have mostly centred on the strength of the US labour market, with the unemployment rate falling to a 10-year low of 4.4% in April (see Figure 14) and employment growth resilient at 1.5% yoy. However, these headline numbers mask remaining pockets of weakness, namely the still high pool of available labour and tepid wage growth – a theme that also runs in the UK and Austria. The US pool of available labour – defined as the unemployed, part-time workers and those not in the labour force but wanting to work, has edged down to 40 million but is still 3.4 million higher than it was in mid-2007. Along with weak worker productivity growth, this seems to be weighing on workers’ wage-bargaining power. The result is that, in CPI-inflation-adjusted terms, growth in aggregate weekly payrolls for private nonfarm employees remains tepid at below 2% (see Figure 15). In effect US workers’ real purchasing power, as derived from wages, is only growing half as fast as a year ago and a third of the rate recorded in early 2015. This pattern is very similar in the UK and Australia and in all three countries this is seemingly creating headwinds for retail sales and household consumption more generally (see US, UK and global GDP growth update – Put the champagne on ice, 28 April 2017). I had flagged back in December some of these dovish risks which the Fed and markets faced. Specifically, I argued that “analysts and markets may now have got ahead of themselves in expecting a sustained and rapid increase in global, and in particular US growth and inflation, unfettered dollar appreciation and the start of central bank rate-hiking cycles in major economies. […]. 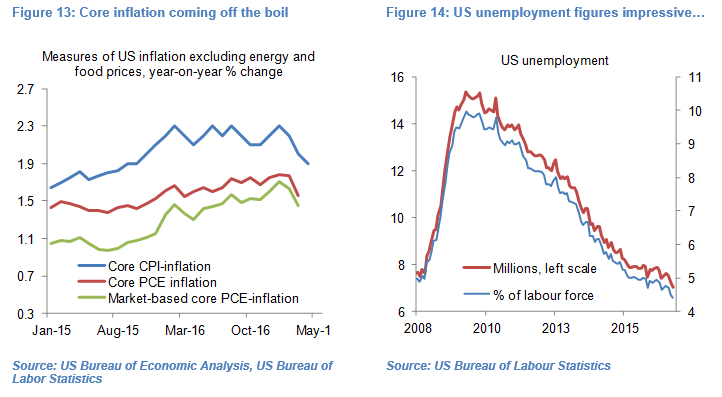 My core reasoning is that US inflation may not rise as fast expected, due to lags in the implementation of Trump’s planned fiscal policy loosening and immigration curbs, residual slack in the US labour market and disinflationary impact of higher US yields and a stronger US dollar […]. As result a more dovish FOMC, faced with still modest inflation, residual slack in the labour market and uncertain fiscal policy program, could conceivably hike fewer than three times next year [i.e. in 2017]” (see Hawkish pendulum may have swung too far, 21 December 2016).